Mules or slip shoes started as heelless slippers worn in Elizabethan times. Later they became associated with the boudoir, and are the precursors of bedroom slippers. The most extravagent examples were sometimes heavily jewelled or highly decorated. 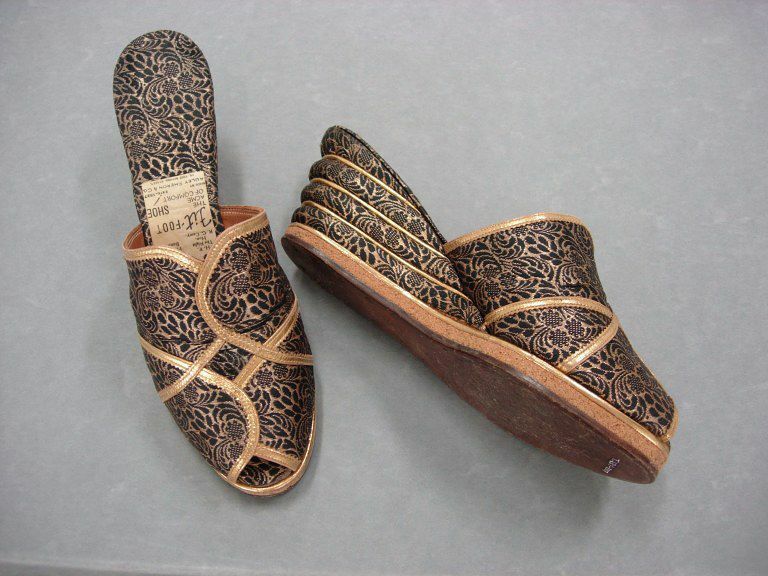 These brocade mules were made for Mrs Joan Kemble Taylor, the wife of Alexander Taylor, who was a Lieutenant Commander in the Royal Indian Navy and a tea planter in Assam. Mrs Taylor lived in India from 1932 to 1962. Significantly, the label in the shoe reads ''by appointment to H. E. The Right Hon. R. G. Casey (with crest) and H. E. Sir Frederick Burrows (with crest)...made by Auley Sheron & Co estd. 1827, 12 Free School Street". The Right Hon. R. G. Casey was the Australian High Commissioner, while Sir Frederick Burrows was the last Governor of Bengal, from February 1946 to 1947. 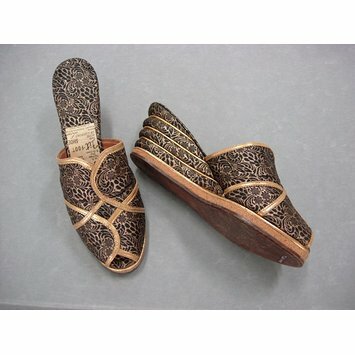 Black and gold brocade, wedge-heeled, open-toed mules with cork and wood soles. Label on inside sole of each shoe. These shoes were made for Mrs Joan Kemble Taylor, the wife of Alexander Taylor, Lt. Com. Royal Indian Navy and tea planter in Assam. She lived in India from 1932 to 1962. The label in the shoe reads ''by appointment to H. E. The Right Hon. R. G. Casey (with crest) and H. E. Sir Frederick Burrows (with crest)...made by Auley Sheron & Co estd. 1827, 12 Free School Street". Burrows was the last Governor of Bengal (February 1946 to 1947) and Casey, the Australian High Commissioner.